The purpose of this blog is to encourage you to cook, eat, drink, and, of course, live well. Here is where I will rave, rant, report, and review. 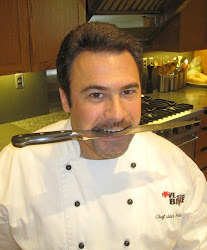 I will offer recipes, food & beverage tips, cooking techniques, terminology, and whatever else is on my mind. Buona mangia! Did you know that, per pint, Guinness Draught has less calories that milk and orange juice? A pint of Guinness has 210 calories. While one pint of semi-skimmed milk has 260 calories and one pint of orange juice has 220 calories. Surprising considering how Guinness is usually described as a "heavy" beer. I think I should to go on diet. So, "Let's drink up, me hearties. Yo-ho!" Love at First Bite and Brian Adornetto - Copyright 2011. All rights reserved. Picture Window theme. Theme images by kcline. Powered by Blogger.